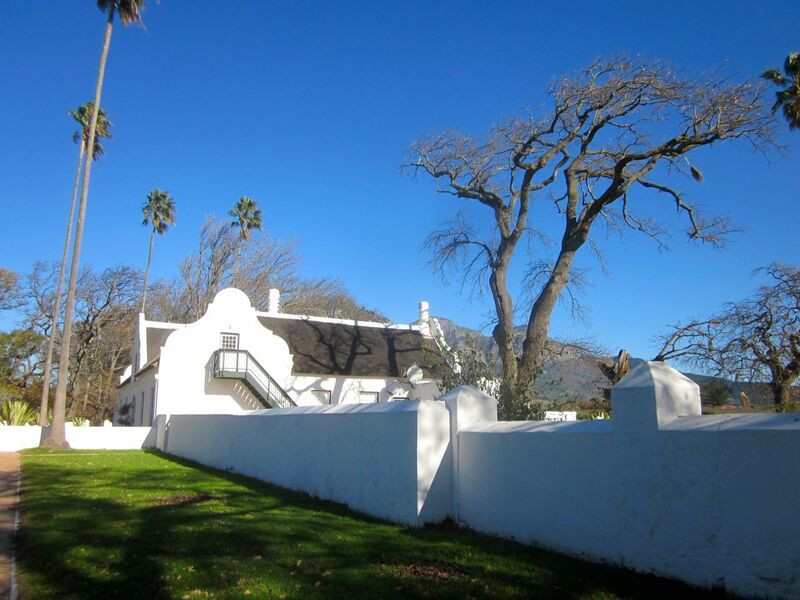 Allee Bleue wine estate is located in Franschhoek. It was originally settled by the French Huguenots in the late 1600’s. In 1999 it was purchased by a German family – Elke and Wilfried Dauphin in 1999. The initial offering of wines from the estate were launched under the Meerust label, which is the original name of the farm. This was unfortunately a bit too close to one of South Africa’s most iconic wines – Meerlust. As such Meerust was eventually renamed as Allee Bleue. The name is wonderfully appropriate as the entrance drive way is lined by beautiful rows of blue gum trees. The original wine tasting was located deep into the estate. Half the fun of the visit was the ramble through the farm. Many years ago they built their restaurant and wine tasting next to the gate near the main road. I can understand the logic – it meant the restaurant and wine tasting were visible from the main road – providing advertising in itself – and it added ease of access. But the magic of visiting the estate was sadly lost. I was happy to discover that the wine tasting has once again moved back to location deep on the estate and the estate is busy debating moving the restaurant permanently through to the same area. 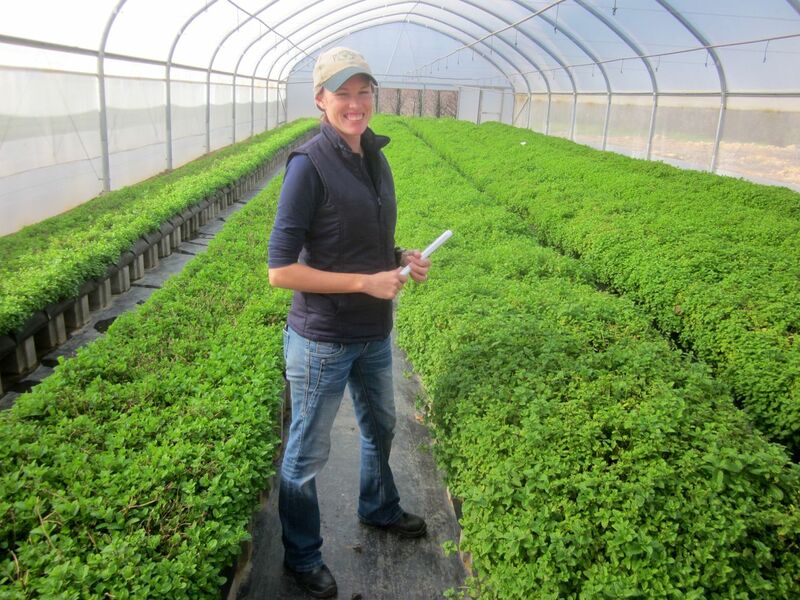 I was invited by the PR agent for Allee Bleue to come and experience their herb tour. I accepted gratefully as it is right up my alley! 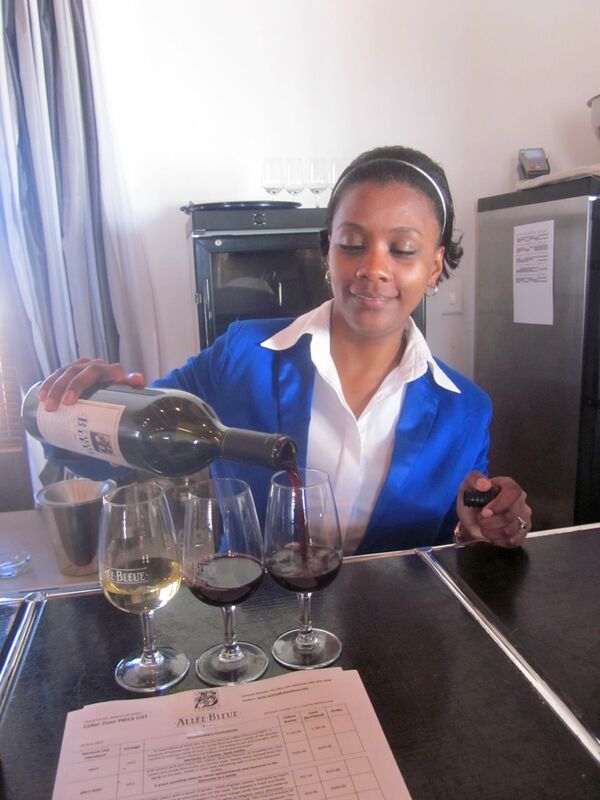 I just love to learn more about all aspects of the food business and my first thought was that this could possibly be an amazing addition for gourmet tour groups and “foodies” visiting the Cape. I loved the herb tour and am planning to include it when planning my next gourmet itinerary! 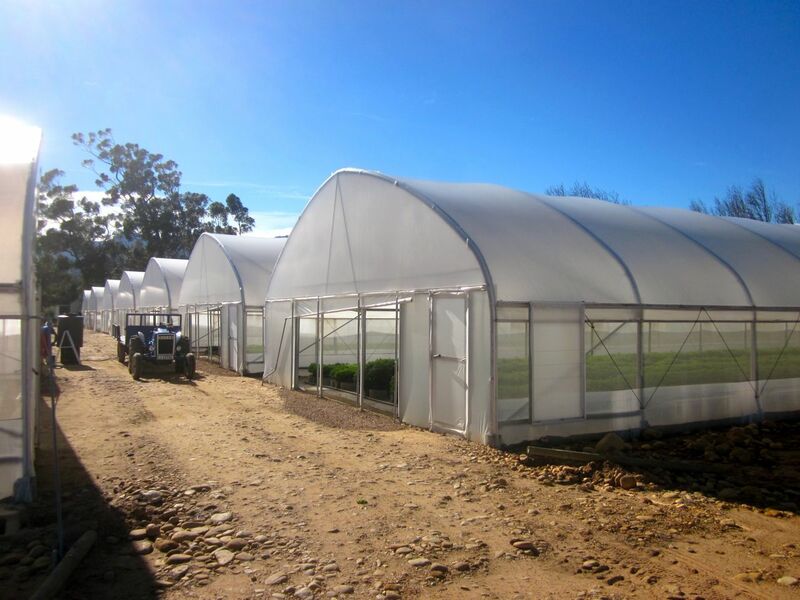 We met up with the very passionate Lario who manages the hydroponic herb tunnels on the estate. Hydroponic herb growing uses a replacement material instead of soil. In their case they use coconut husks which they source mainly from Mozambique or Sri Lanka. The material is fairly expensive – but does last for a few years! In the picture below check out the pipes that go across the broken down coconut husks. 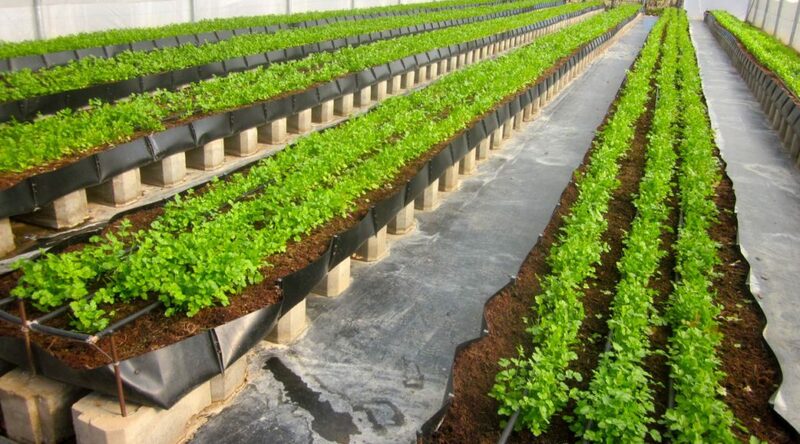 These pipes are used to water the herbs, and also to feed the fertilizer that the plant needs. 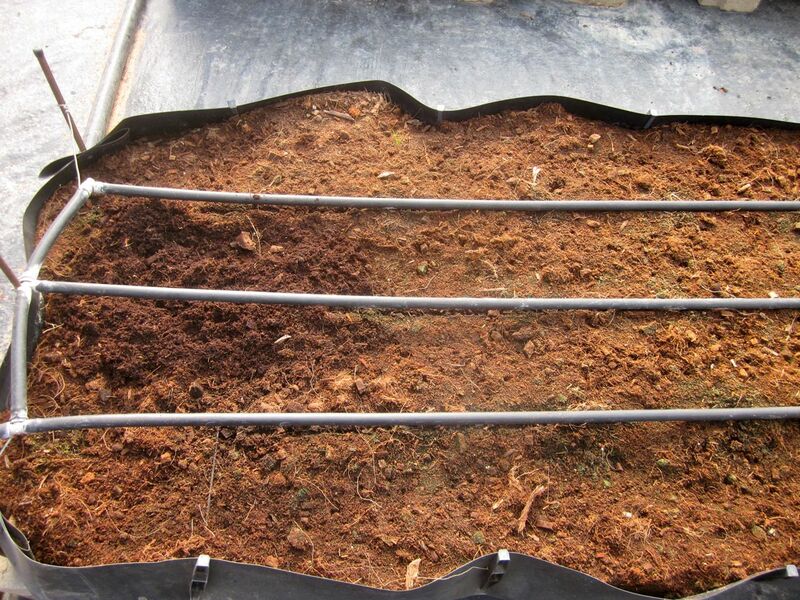 The fertilizer is combined with the water and then is pumped into the herbs. 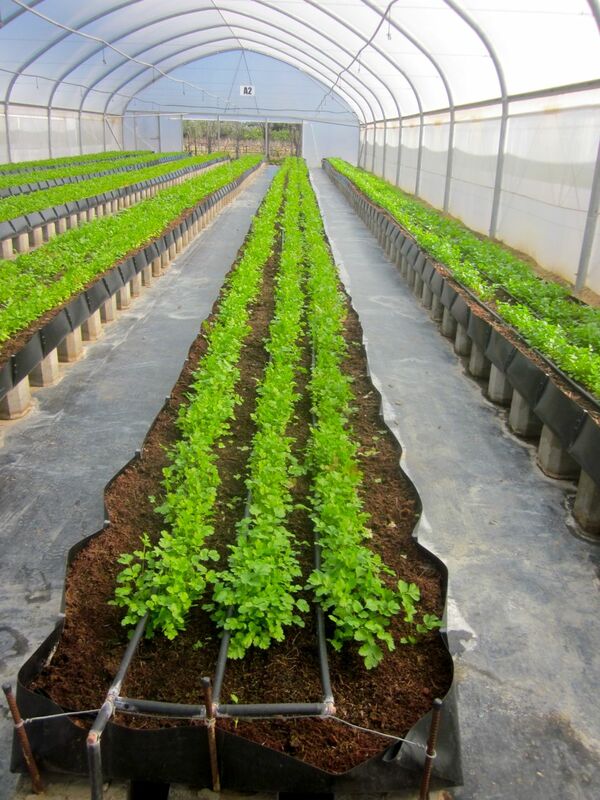 Hydroponic planting results in clean and high quality herbs. The herbs that I saw were almost picture perfect! Yes – quite simply they were beautiful! And the smells! I could have sat in the corriander all day. The mint was almost therapeutic. My idea of bliss would be to have a hammock in the mint hot house and a good book……..and perhaps a mint cocktail! It was really interesting to learn all sorts of “herby” facts – for example, they manage to cut more corriander in winter (4 good cuttings & a 5th that is not as high quality and goes into processed meals) vesrus in summer (2 cuttings) – as the corriander turns to flower more quickly in summer. Mint however quite simply grows for years – there is no need to replant, however it is best to cut back every now and again! The herb tour runs every Friday at 10h30 and takes about 1 to 1.5 hrs. Cost: R45 per person. For large groups the tour can be booked on other days. The Herb Tour can also be combined with a herb inspired 3 course lunch prepared by the estates executive chef Christine Moodlie. 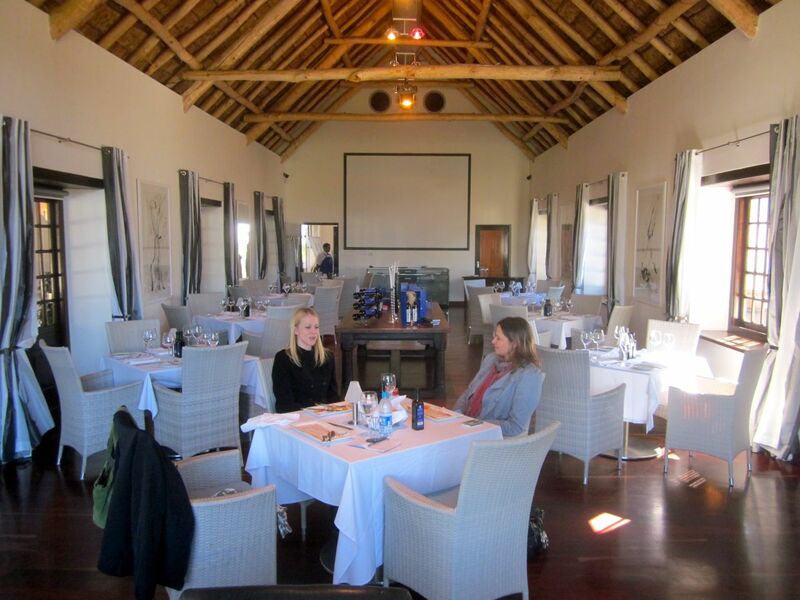 The cost of the tour combined with the 3 course lunch would be R185 pps. Below is a picture of the current restaurant location at Allee Bleue. They may keep it up at the top of the estate where it is currently being housed – but the final decision still needs to be made. 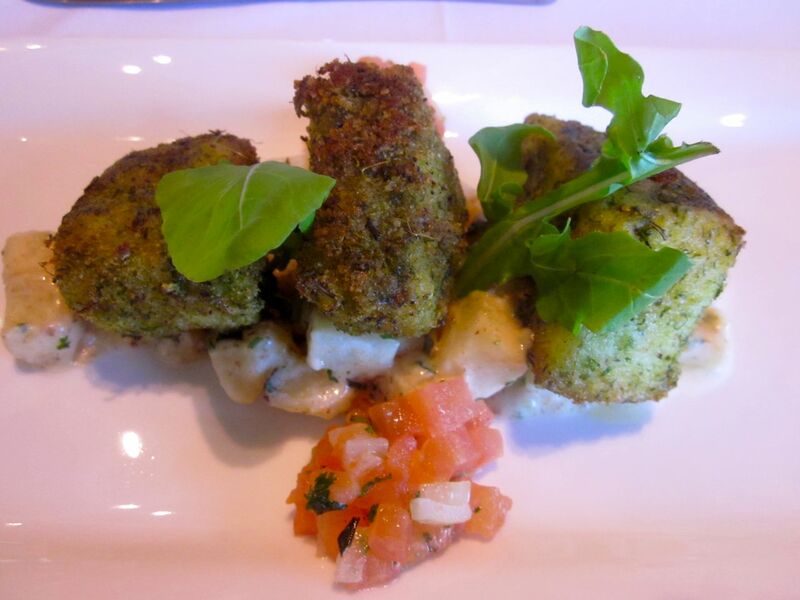 Below is a picture of our starter which was a pesto chicken with a herb salad. This was followed by a main course of Cape Salmon is a herb crust on potatoes. The dessert was a crepe with a lavender ice cream. I enjoyed the dishes, but was quite surprised that the serving staff did not introduce each dish and did not know what the dishes were. 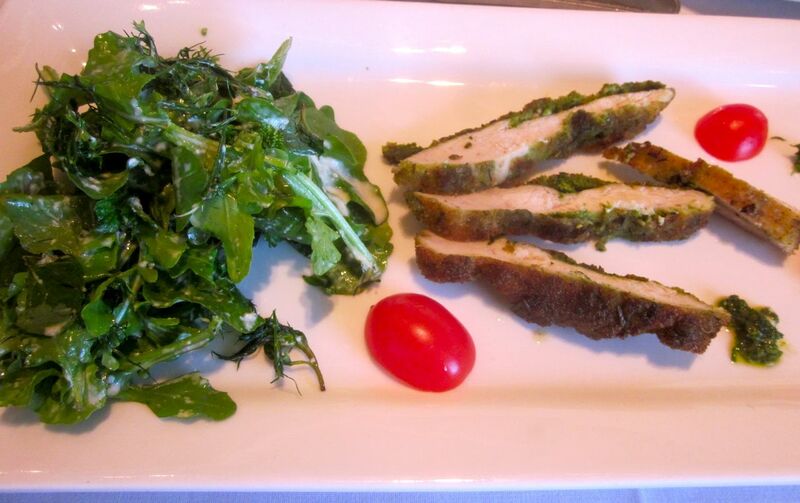 I am not sure how new the herb lunch is, perhaps it is the first time this lunch has been served? The staff definitely need to be trained in presenting the dishes. The staff were in all other ways really efficient and very friendly. While on the estate I also enjoyed a short wine tasting. The pinotage has been made in the new favourite “mocca” style which has taken South Africa by storm. I think that I have overdosed on this style of pinotage and prefer it with a less burnt flavour. I really enjoyed the Isabeau – which is a blend of semillion, chardonnay and viognier. This would be a fabulous wine to pair with food. 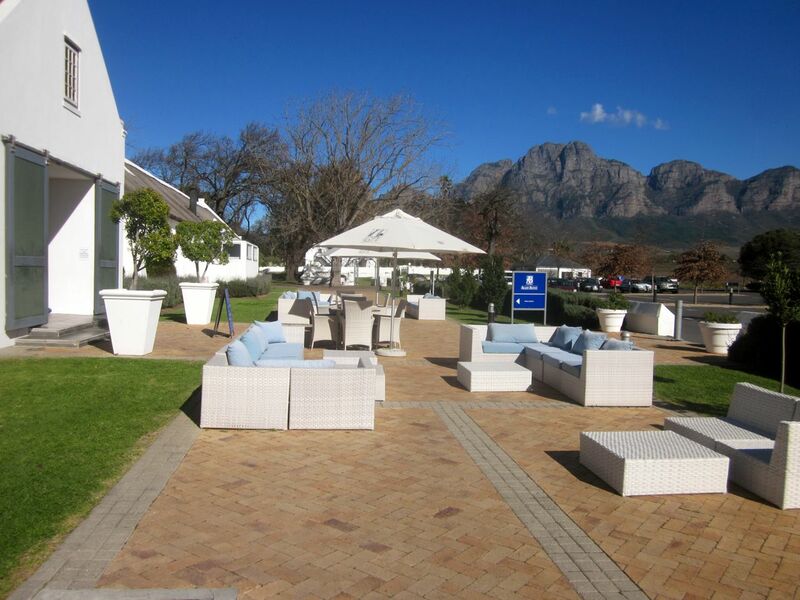 Allee Bleue has a variety of venues that can be used from anything from a small wedding through to a large corporate product launch of up to 500 people. They also offer picnics on the grass next to the gorgeous old manor house. Monday to Friday, 9.00 a.m. – 5.00 p.m.
Saturday: 10.00 a.m. – 5.00 p.m.